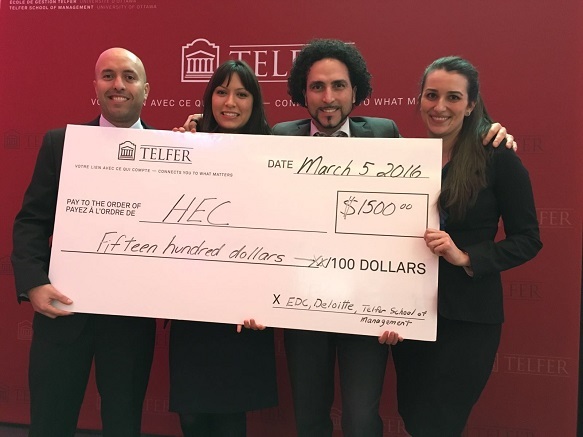 News > 2016 > MBA: 1st place in the Telfer School of Management case competition! MBA: 1st place in the Telfer School of Management case competition! Congratulations to the four MBA students who took first place in the Diversity and Inclusion MBA Case Competition in Ottawa this past weekend! The School’s delegation of Ben Mansoura, Amandine Michaud, Niki Parassidis and Abdel Zniber had three hours to prepare their presentation and then impressed the panel of judges. This was the first edition of this competition, organized by the Telfer School of Management in partnership with EDC and Deloitte. Abdel Zniber, Amandine Michaud, Ben Mansoura and Niki Parassidis.